Very Sale up to 50% off on selected Fashion, Footwear, Home and Electricals. Fashion and Footwear end tomorrow! Bed for your child ?? Not in my house. A question, what kind of people buy the bed in picture? Double at the bottom and single at the top. Is the double bed for a couple? Then won’t they need some privacy? A question, what kind of people buy the bed in picture? Double at the …A question, what kind of people buy the bed in picture? Double at the bottom and single at the top. Is the double bed for a couple? Then won’t they need some privacy? I’m guessing it’s for kids not adults. I bought one for my 3 kids. One sleeps at the top. The younger two at the bottom. The double is not for a couple. An older child will often appreciate a larger bed . The double is not for a couple. An older child will often appreciate a …The double is not for a couple. An older child will often appreciate a larger bed . 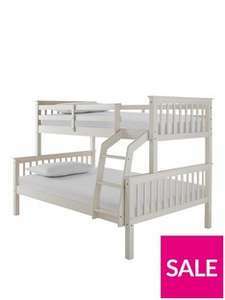 Double bed for an older child, you’re spoiling your child. You have a house?! Eee someone's doing well. Heat given. Will let someone else ride on your coat tails soon but some really good deals on Bristan taps and showers. House? You were lucky to have a house! We used t' live in one room, all hundred and twenty-six of us, no furniture. Half floor was missing; we were all huddled together in one corner for fear of falling!